I am forever indebted to the Tampa Bay Rays; they were the ones who lost to my beloved Phillies in the 2008 World Series. I couldn’t be more thankful to them for losing and allowing me to have the experience that every sports fan dreams of: a championship. 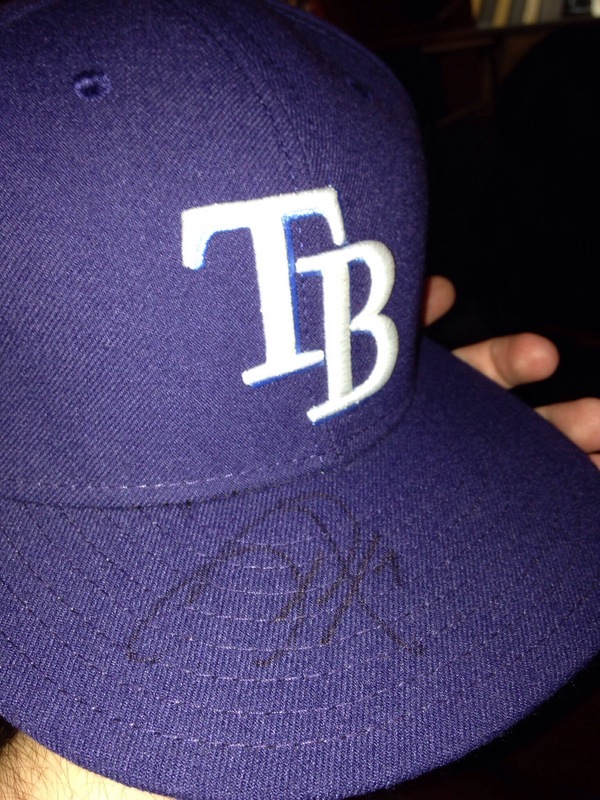 Of all the caps I own, this is the only one that I have signed by none other than the Tampa Bay Rays’ very own David DeJesus. David DeJesus first came to my attention as player as a member of the the Cubs when I needed a fourth outfielder for my fantasy baseball team. DeJesus isn’t the type of player a casual fan would know; in his ten year career, he has never been an All-Star, or won a Golden Glove, Silver Slugger or any of the major awards. It was for a two week period That being said, he has been as solid an outfielder as you could ask, with a very solid career .279 batting average. Spending 10 years with the Kansas City Royals, he batted about .300 twice before being traded to the Oakland Athletics for the 2011 season for Vin Mazzaro and Justin Marks. After a lackluster year with the A’s, DeJesus signed a two year deal, $10 million with the Chicago Cubs to be their starting right fielder, preforming admirably in the process. Midway through the 2013 season, DeJesus was the subject of consistent trade rumors. Fearing division rival Atlanta Braves would trade for him and push them further out of the NL East race, the Washington Nationals traded for him for a player to be named later. They truly had no need for him; it was only a ploy to keep him out of the Braves’ hands. After just three games played, and no hits, he was traded to the Tampa Bay Rays who were trying to lock up a wildcard spot. After beating Cleveland in the wild-card play in game, and a defeat in the ALDS to the Red Sox, the Rays signed him to a two-year $10.5 million contract. Seton Hall’s archenemy is instate rival Rutgers. The basketball game between them, terribly named the “Turnpike Tussle” is a huge deal for the fans and students of both the schools. Originally taking place twice a season when they were both part of the original Big East conference, the Rutgers Scarlet Knights are playing on season in the American Athletic Conference before leaving for the Big 10 and the game is now only once a season, alternating home locations. Being the two largest basketball programs in the entire state of New Jersey, they are often fighting for recruits, only intensifying the rivalry. Last year Seton Hall was swept for the first time in years, so the players, fans and student body all had a chip on their shoulder. This year I had the pleasure of going to the Rutgers Athletic Center to see the first “Turnpike Tussle” of my college career. Just want to take a moment to give a big thanks goes to my friend Anne, who was able to get us an extra ticket to the game so Sean was able to go. 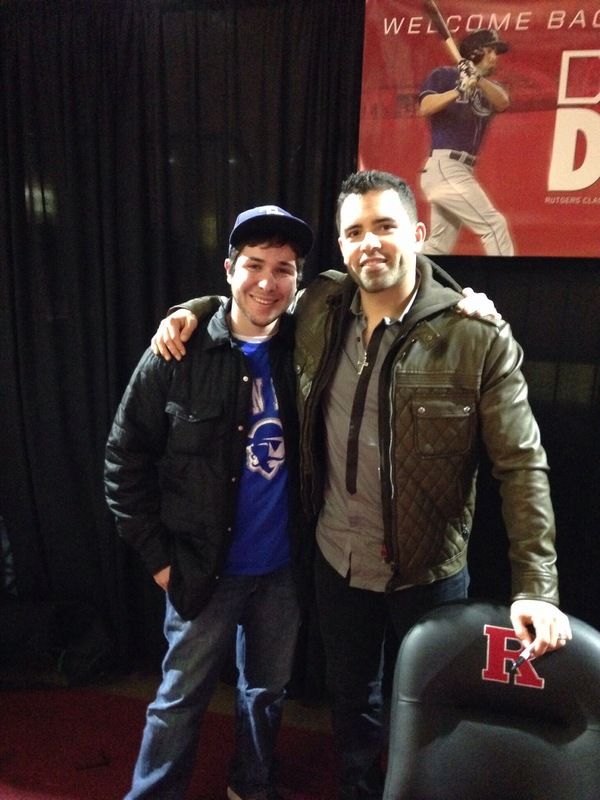 A day before the game, we learned that New Jersey native and Rutgers legend David DeJesus, who played at the school for three seasons, setting several school records (some of which were latter broken by Rutgers-turned-Reds’ outfielder Todd Frazier), would have a free autograph signing before the game. As much as a hate for Rutgers was instilled in me by Seton Hall’s orientation videos, I still love the game of baseball and was very excited to get something signed. Since I lacked a baseball in my dorm that I would be able to get signed, I figured a New Era Cap would be the next best thing. He was legitimately one of the nicest athletes I have ever meet; even took time to talk some football as my beloved Tampa Bay Buccaneers beat his Buffalo Bills that week. He was incredibly kind to keep everyone who came up to his table, taking time to personally ask for everyones name in line, and didn’t take a cent from anyone. Staff even handed out pictures from his games at Rutgers for him to sign. Couldn’t be a nicer guy. After getting him to sign my hat, some of the Rutgers pictures (one for me and one for my friend Harry), taking a picture with him, I was treated to an amazing basketball game that I will never forget. The Seton Hall Pirates won 77-71 in what was an instant classic, and I even got to see my oldest childhood friend Carlos, who happens to go to Rutgers; even though we supported different sides, it is always great seeing him. I left the building with a great memory of a fantastic night, and a signed cap to remember it. This is one cap I will not wear again, instead having it proudly displayed and consistently appreciated. This entry was posted in New Era Caps and tagged Chicago Cubs, David, Dejesus, rutgers, Seton Hall, Tampa Bay. Bookmark the permalink. His dad was the coach for the all-star team i played for this summer and was the coach for the team we lost to in the championship. That family lives and breathes baseball.